I had the unfortunate displeasure of watching Book of Eli a few weeks ago -- it was really bad, though I do have a new low standard to compare other movies against. However, as bad as the movie was, the silver lining was a product placement of Tour in-ear Monster Beats by Dre headphones. One of the most frustrating things that I've found with regular in-ear headphones, even nicer ones, is that the cords will inevitably tangle and fray by virtue of the typical cylindrical cable design. The Tour headphones, on the other hand, use a flat cable that can't tangle by the nature of its shape and that at least appears to be less subject to fraying. Flat cables are a smart innovation -- it's easy to wrap them around the phone and easy to put them in the carrying case. Frankly, I worry less about putting these in a case due to the nature of the design. Sound quality is very good -- it is at least equal to my Shure in-ears if not a little bit better. I'm a bid fan of the foam and silicone blend tips -- you'll need to order the separate Monster tip kit to get the foam ones, but if you're looking for the best outside noise reduction and the best fit without having to use the over-ear hangers, the foam tips are probably the best option. The tips that come on the heaphones probably won't fit your ears -- unlike Shure and some other manufacturers, you're likely going to have to change out the tips, but they do include a good assortment of silicone tips for sizing (presuming you don't order the extra tip kit). You have to fully seat the jack in order for the Talk Control functions to work -- if it doesn't click in, you may still get music, but you won't be able to use any of the volume control or phone control functions. Although I don't use one, I tried it with an iPhone 4 that had a bumper and you do not have to trim the bumper to get it to fit. Although the manual says that the Talk Control is compatible with iPhone 3GS & 3G, all functions are working without problem on the iPhone 4. The right angle on the jack connector is great and makes the headphones feel much more low profile; the phone also sits better in a pocket either upside down or to the side without a large jack sticking out of the top. 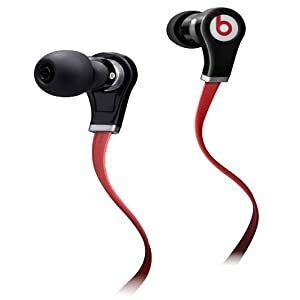 Warranty on these headphones is 3 years, which is better than most of the other manufacturers that usually offer a 1 year warranty. The headphones offer a sealed channel with a screen as opposed to an open tube that needs to be cleaned out. You wouldn't think this is a big deal, but I've had the open tube kind and it is not fun to try and clean them out when they get clogged. The microphone is noise canceling on the Talk Control model and seems to work pretty well; not at the level of a Jawbone, but pretty good. I'll see if they hold up in the long term, but am pretty happy with them now. Note that there is a version that does not include the Talk Control functions that is less expensive if you're just looking for good headphones.